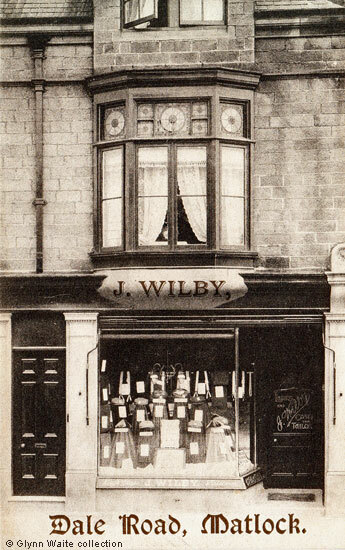 In the first decade of the twentieth century James Wilby worked from this shop on Dale Road. It says "J. Wilby, Ladies & Gents Cash Tailor" on the glass of the door. The shop was then in Dale Crescent but the address is now 59 Dale Road. Although the shop front has changed in the intervening years the first floor window with the Victorian decorative coloured glass can still be seen today, as can the down pipe from the gutters (launders) between the two shops. On the back of the postcard is a scribbled note dated 6th May 1908 about someone being unwell, but printed down the left side is "From JAMES WILBY, Ladies and Gents Tailor, DALE ROAD, MATLOCK BRIDGE. / Ladies Costumes from 45/- / Suits to Measure from 37/6 / Frock Coat and Vest from 45/-". James Wilby was born in 1862, a son of John and Ann Wilby of Barnsley. His father was a tailor by trade and John's three sons carried on the family business. For a while James worked with his brother Joshua but in 1888 the partnership between them was dissolved and James moved to Rotherham where he continued to work as a Tailor and Hatter. He had married Letitia Wilkes Green in the Rotherham District in 1890. By 1901 the couple were living in Tansley with their children and at some stage before 1911 the family moved to Henry Avenue. James was not at home at the time of the 1911 census as he was visiting another clothier and outfitter in Penistone, and he was then unemployed. It is not known when the Wilbys moved away from Matlock, but James did not advertise in Kelly's 1912 Directory. The Gillespie's, Archibald and Mary Elizabeth, took over the Dale Road shop vacated by Mr. Wilby in 1910. Archibald Gillespie had been a cutter in a leading North of England firm before setting up his business in Dale Road. He established workshops, where tailoring work was carried out, and sold well known brands such as Aquascutum. About 1935 he ventured into poultry farming at Haxby, though he seems to have been less successful at that occupation. He and his wife were still in Matlock and living on Snitterton Road when war broke out in 1939 and are buried at St. Giles'..
in the top of the first floor window. 1. Postcard in the collection of and © Glynn Waite. "Huddersfield Chronicle," 4 Feb 1888. Partnerships dissolved: Joshua Wilby and James Wilby,16, Sheffield-road Barnsley, tailors. Rotherham 1891 census, Tansley 1901 census and the 1911 census are available on "Find-my-Past". "Derbyshire Times", 29 September 1928. The Matlock's shopping festival. "Derby Daily Telegraph", 14 November 1936.